Pristine snow and full throttle! 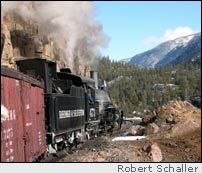 The Durango & Silverton Narrow Gauge Railroad is located in downtown Durango at 479 Main Ave, Durango, CO, 81301. Reservations and information can be obtained by telephone at 1-888-TRAIN-07, or you can check out the railroad's website at www.durangotrain.com. Click here for a summer trip on the S&DNGRR. Lodging: While in Durango, accommodations can be found at dozens of motels and hotels. Try the historic Strater Hotel downtown, or for budget accommodations, the Econolodge on US550 a little north of the downtown area is clean and friendly. I also recommend the Ramada Inn Express on US550; the facility is new, prices reasonable, and the staff was friendly and accommodating. Food: Try the Ore House downtown for steak or burgers, or if you like Italian cuisine, Mama's Boys is excellent and is located in mid-town along US550. 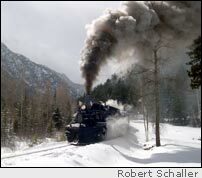 On February 26, 2005, the Durango & Silverton Narrow Gauge Railroad operated its first winter photo excursion train. White snow, black locomotive, yellow passenger cars -- how could I possibly resist? Getting to Durango in time for an early Saturday boarding meant leaving Phoenix on Friday afternoon. My daughter Mandy and I took the fast route -- north on I-17 to Flagstaff, I-40 to Gallup, NM, and then US491, US64 and US550 through Shiprock and Farmington. We arrived in Durango 500 miles later at about 1:30 a.m. While there were some rain showers, the roads were clear. Next morning, we arrived at the D&SNGRR depot about 7:20 a.m, and were in our seats shortly thereafter. As soon as there was no time left to run back to the truck, I discovered I left my sunglasses behind as well as my watch. The harsh glare of sunlight reflected off snow made some parts of the day very uncomfortable for me. The watch, however, I didn't much care about. It was, after all, a Saturday and the only time schedule we had to meet was already met. 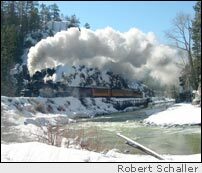 The train, with 100 intrepid train-lovers and photographers aboard, chuffed out of the depot promptly at 8:00, and headed north through Durango and along the Animas River. The plan was to stop at several pre-set locations between Durango and Cascade Canyon. The railroad crew had marked "photo lines" with ribbon and crime-scene tape, and we disembarked according to their instructions, keeping to a well-defined pathway. The goal was a pristine field of view, with no human footprints in the snow to spoil our photos. The train would let us off, back up, and then charge past us at top speed making as much noise, steam and smoke as possible. The D&SNGRR had picked the locations for us with regard given to scenic location and vantage, so that our photos would be worth the effort. They did a great job. North of Durango, the tracks follow the Animas River through an area called "the highline." The tracks were laid on a narrow shelf blasted out of the mountainside in the mid-1880s, several hundred feet above the river. Quite simply, it is spectacular! Farther north, the rails run along the banks of the river as they continue toward Silverton. A more scenic location doesn't exist anywhere. The railroad doesn't venture too much beyond Cascade Canyon in winter, because of rock slide and avalanche dangers, but with the breath-taking locations they chose for our photo stops, I didn't feel cheated. On the return trip, we saw deer, elk, and at least one red-tailed hawk. We arrived back in Durango just in time for an early dinner at a great restaurant called "Mama's Boys" and had a leisurely evening and a good night's sleep before heading back toward Phoenix. Around Shiprock, I made frequent photo stops along the highway as we passed that very scenic area. We found a little freezing rain and some snow showers between Tohatchi and Gallup, but the roads were still clear, and we were home by 7:00 p.m. The railroad operates photo junkets every autumn, but this was their first winter trip. They hope to make these a tradition too. I am already thinking about a complementary set of steam train photographs to be taken in the midst of autumn color along the Animas River.